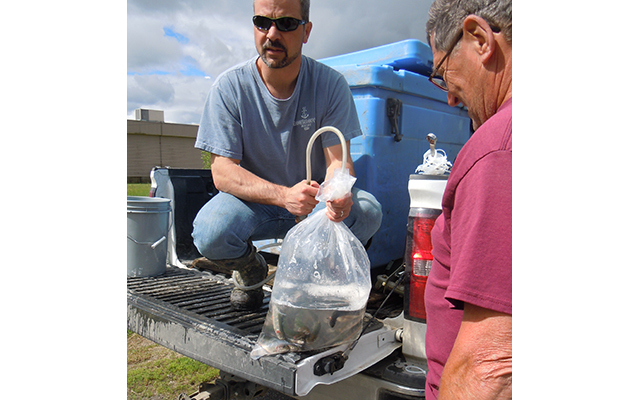 Gary Picard of Mountain Springs Trout Farm in Frenchville bags up the final Brook trout at the Southern Aroostook Soil and Water Conservation District’s trout sale on Saturday, June 3, 2017. The fish hatchery was started 40 years ago by Picard’s parents and is now closing after serving countless landowners throughout the state with Brook trout and rainbows. The SASWCD has provided a trout sale program for most of its 75 years with many of those in partnership with Mountain Springs.